Columbia Residential partnered with the DeKalb County Community Development Department, the Housing Authority of DeKalb County, and the Development Authority of Decatur to transform a former parking lot adjacent to the Avondale MARTA station and bring new, affordable senior housing options to Decatur. Avondale Senior is part of a broader mixed-use transit-oriented development (TOD) located adjacent to the Avondale MARTA station. The agreement calls for subdivision of the site into as many as 8 parcels. The center parcel will contain a 900 space seven story parking structure for use by commuters as well as tenants in the adjacent sites. The overall development is planned for affordable and market rent housing, retail and commercial with one parcel set aside for a future school in that school district. The new senior-living apartments offer the following amenities: patio/balcony, blinds, carpeting, central air conditioning, coat closets, dishwashers, ceiling fans, garbage disposals, hand rails, microwaves, ovens, pull cords, refrigerators, washer dryer hook-ups, a business center/computer lab, a clubhouse/community room, a courtyard, elevators, exercise facility, a parking garage, central laundry, off-street parking, easy access to MARTA, on-site management, a picnic area, a theater/media room, limited access, courtesy patrol, video surveillance, and service coordination. Tindall Senior, 76 units of new construction, is the first phase of the redevelopment of Tindall Heights, a former public housing complex built in 1940. Macon Housing Authority has bee pursuing the redevelopment of Tindall Heights since 2002. Finally the right team came together. In-Fill Housing, Inc. is a Georgia not-for-profit housing developer created by the Macon Housing Authority. In-Fill works both in and outside of Bibb County to provide affordable housing for low and moderate-income families. Since 2001, In-Fill Housing has developed more than 1,200 units of affordable housing, including three senior properties, nine family properties, and two properties for special needs populations. The Macon Housing Authority (MHA) is a public housing authority chartered under the laws of the State of Georgia in 1938. MHA uses no local tax revenue in its operation; it derives the majority of its revenue from rents and federal subsidies. The Federal Investor is Wells Fargo. Wells Fargo is active in affordable housing investing and lending, providing construction and permanent financing, and tax credit equity. Tindall Towers has one and two bedroom units, with amenities including Central Air Conditioning, Mini-Blinds, Carpet, Coat Closet, Ceiling fans, Disposal, Refrigerator, Stove/Oven, Dishwasher, Emergency Pull-cords , Microwave,Washer/ Dryer hook-ups, Pantry. The community offers On-site management, Perimeter fencing, Community Room with Kitchen, Fitness Center, Computer Room, Gazebo, Controlled Access, Video Surveillance, Laundry Facilities. Originally constructed in 1885 as the Mary Telfair Hospital for Women, 100 years later the building was turned into a senior living community in 1985. In 2018 the historic Telfair Arms Senior Apartment Community starts a new chapter after undergoing an extensive $5.8 million renovation.The building’s 53-apartments, which are fully occupied, received new cabinets, counter tops, flooring, fixtures and fresh paint. The building’s elevator was modernized and several common areas including a library, computer room and wellness suite and service coordinator’s office were also added. Along with upgrading the 53-units, the work included the replacement of mechanical systems and windows and the restoration the building’s original grand staircase. Sugar Creek Is proud to have been a part of bringing the shine back to a Savanah landmark. Vinings at Oxford, a mix of garden style, single story flats and town homes, celebrated it's Grand Opening and Ribbon Cutting on November 17th 2017. Ideal for families this quiet community offers a laundry room,community room, library, picnic area, planned community social events as well as many ammenities in each unit. Sugar Creek was pleased to partner with NAHPA 2015 GA, Susquehanna Valley Development Group, Inc., Regions Bank, Fyffe Construction, and Vantage Management, to provide affordable gracious living to Cedartown. Hunt School Village is a beautiful new 60-unit affordable rental housing development for persons 62 and older. The approximately $12 million investment represents the first new senior family development in East Macon-Bibb in more than 20 years, and is providing much needed affordable housing to east Macon. The former school administration building was converted into offices and community space for residents, and includes meeting rooms, kitchen, fitness center, computer center, and multi-purpose theater room. The two original classroom buildings were demolished to make way for two new 3-story buildings. These two new buildings each house thirty one and two-bedroom units. Hunt School Village is a gated community with a gazebo, benches, pavilion, beautiful landscaping, and central laundry. All units include carpeted bedrooms, luxury vinyl tile living spaces, microwave, range, refrigerator, dishwasher, ceiling fans, fire sprinkler system, and washer/dryer hookups. All units are handicapped accessible and adaptable. The site is managed by a full-time manager and maintenance staff. National Church Residences held a grand re-opening of Sister’s Court Apartments on Tuesday, April 25th, 2017. Originally built in 1894 as the Little Sisters of the Poor, the building served as a convent and refuge for Savannah’s low-income senior citizens until the building was sold in 1971. It was later transformed into affordable senior housing and, in 2014, was purchased by National Church Residences. With plans designed by Foley Design Associates Architects and renovations performed by Choate Construction, Sister’s Court Apartments underwent a major historic preservation that included the renovation of two buildings, the demolition of another and the construction of a new four-story building in its place. Sugar Creek celebrates the March 3rd groundbreaking ceremonies at Phoenix House, a $10.2 million dollar redevelopment project in southwest Atlanta. When complete, Phoenix House will provide 69 studio apartments with on-site supportive services for adults facing the challenges of mental illness and homelessness. The innovative housing model combines shelter, support and services to facilitate increased personal and economic self-sufficiency and self-determination among the residents. National Housing Trust/Enterprise Preservation Corporation (“NHT/Enterprise”) is a 501 (c)(3) non-profit organization whose mission is to preserve and improve affordable multifamily homes throughout the United States, with a special emphasis on federally assisted or insured rental communities. Project Interconnections, Inc. (PII) is a 501(C)3 nonprofit corporation whose mission is to develop and manage affordable permanent housing with on-site supportive services for adults facing the challenges of mental illness and homelessness. Renowned developer and urban visionary Jim Rouse and his wife Patty co-founded Enterprise in 1982 with an ambitious vision of ending poverty in the U.S. More than three decades later, Enterprise remains dedicated to improving the affordable housing system by investing capital, implementing solutions on the ground, and transforming public policy. With additional support from Invest Atlanta and local government Phoenix House is off to a great start. Mayor Kasim Reed was joined by Tim Keene, Department of Planning and Community Development Commissioner, Camilla Knowles, Department of Community Affairs Commissioner, Janis Ware, SUMMECH Development Corporation Executive Director, and Atlanta City Councilmember Cleta Winslow at the Ribbon cutting ceremony for the first scattered site development in the City of Atlanta. Mechanicsville consists of 66 new construction, single family homes being built on acquired vacant land and on land where formerly vacant single-family homes were demolished. Eight single family homes will be renovated for occupancy. Currently, seven homes are completed. These new homes are bringing value to the existing neighborhood and affordability to communities that need it the most. Funding for this project is provided by US Department of Housing and Urban Developments Low Income Housing Tax Credit and Neighborhood Stabilization Program. Partners include Sugar Creek Capital, Bank of the Ozarks, CAHEC, Columbia Residential Housing. Atlanta, GA (September 22, 2016) - Sugar Creek Capital is pleased to have participated in the Grand Opening of Stanton Oaks. Stanton Oaks is the rehabilitation of a 43-unit family apartment complex located in Atlanta, Georgia. The project is a partnership between The Woda Group Inc., a top 10 nationally ranked affordable housing developer from Westerville, Ohio, and Parallel Housing Inc. a nonprofit sustainable affordable housing developer from Athens, Georgia. This $7.8 million rehabilitation project represents part of the Atlanta BeltLine’s commitment to affordable housing within the Atlanta BeltLine Planning Area. The rehabilitated Stanton Oaks complex has five 1-bedroom units, eleven 2-bedroom units, twenty-two 3-bedroom units and five 4-bedroom units. The renovated development features numerous amenities for the residents to use and enjoy, including a multipurpose community room, a fully equipped fitness center, a computer center, a laundry facility, an outdoor grilling area and a state of the art tot-lot. 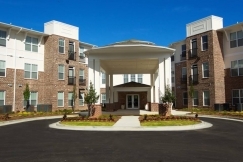 Powder Springs, GA (April 29, 2016) - Abbington Trail Apartments is a beautiful new affordable senior apartment community located in Powder Springs, GA. The property was developed by Rea Ventures Group, LLC based in Atlanta, Georgia. Funding for this community was made possible with $14,310,840 in federal and state tax credits awarded by Georgia Department of Community Affairs. Those tax credits raised over $9,700,000 in equity from Bank of America and Sugar Creek Capital. In addition, Bank of America is providing permanent financing of $736,058. Abbington Trail provides 60 two- and three-bedroom homes to Seniors age 62 and over. On-site amenities include, but aren't limited to, a community room, fitness center, media room, library and computer center. The property was built to Earth Craft Multifamily and Communities standards and constructed out of highly energy efficient building materials and systems to keep residents' utility costs low. The site was designed to achieve a walkable community focused on smart planning practices. Content ©2014-2015 Sugar Creek Capital. All Rights Reserved.